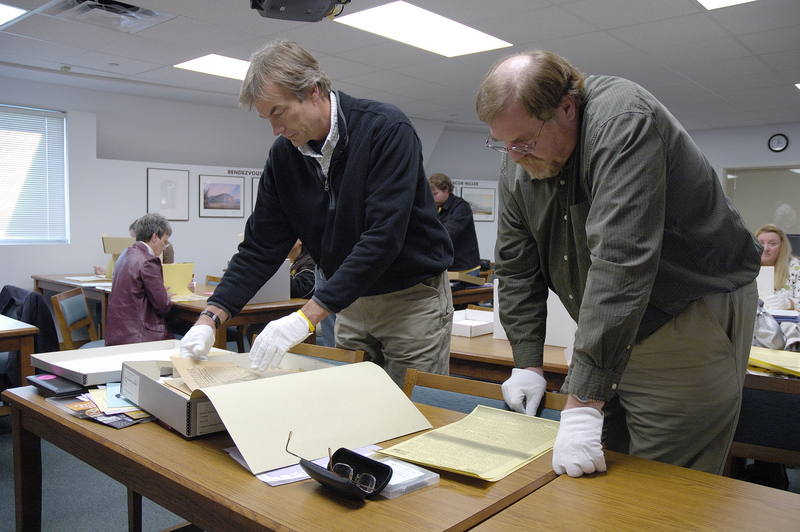 Workshop participants conduct research in archival collections. The American Heritage Center and the Cowboy Coalition from Natrona County School District recently collaborated on a three-day teacher workshop designed to demonstrate the use of primary documents in the teaching of American history and government in grades 4-12. The workshop for teachers incorporated research in collections documenting a number of topics including the Heart Mountain (WY) Japanese Relocation Center, Oregon Trail, Hollywood 10, and Project Wagon Wheel (a 1969-74 plan by the US Department of Energy to detonate thermonuclear devices underground in Wyoming’s Sublette County for the purpose of releasing natural gas trapped in rock formations). Participants were able to earn continuing education credit along with transcript credit from the University of Wyoming. Workshop participants also heard presentations by Dr. William Moore of the University history department, Dr. Carol Bryant from UW’s department of secondary education, and Rick Ewig, assistant director of the American Heritage Center. Dr. Moore spoke about the context in which the blacklisting of the Hollywood 10 took place. Dr. Bryant demonstrated various strategies for using primary documents in the classroom, and Rick Ewig talked about fact and fiction and the misleading nature of some primary sources in the historic bio-pic, Hildalgo. Visit the U.S. Department of Education Teaching American History program web site to learn more about the grants and how to apply. This entry was posted in events, grants, K-12 education, outreach. Bookmark the permalink.